R1997, John C. Taylor. 39", ML. 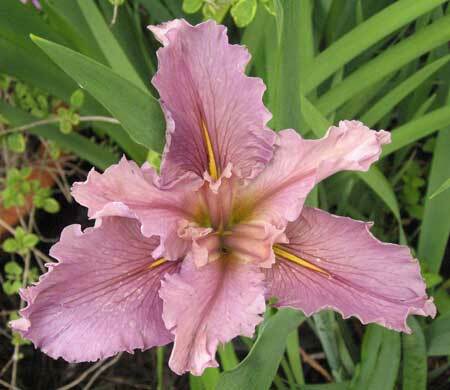 The registration describes the iris as having "marbled purple" standards with a darker center line and purple falls fading to lighter purple near the edges. The narrow steeple signal is yellow. Styles described in the registration as purple and grayed red. I don't see this as purple. A unique color, more of a pinkish lavender. Lightly ruffled. A favorite iris. Dancing Vogue x Dural Dreamtime.